I haven’t written in quite awhile because I was busy. 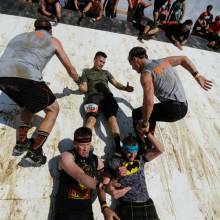 Busy training for PROBABLY THE TOUGHEST EVENT ON THE PLANET, otherwise known as the Tough Mudder. (Okay, maybe I wasn’t grinding out ten-mile runs or doing burpees at five in the morning. More realistically I was eating Doritos and watching Game of Thrones). It’s also probably not the toughest event on the planet; that distinction likely belongs to the Death Race, a 48-hour monstrosity that includes chopping up an oak tree stump with a hacksaw to reach the starting line and psychological torture like eating a bag of onions and counting out $500 in pennies while squatting in an icy pond. There was an obstacle called the Mud Mile, which we had to run twice. 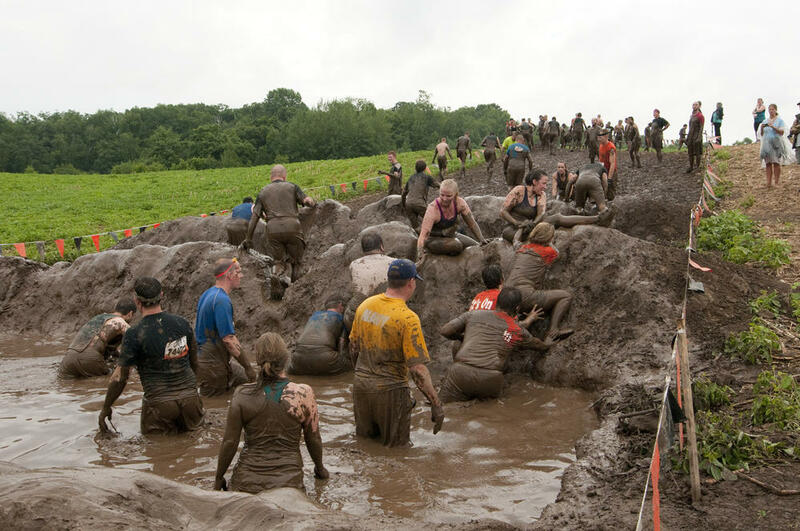 The Mud Mile was simply a chain of hills and ditches, filled with water and mud. This obstacle would not have been hard except that while sliding into the first ditch, I dramatically misjudged the depth of the slurry and ended up generating a projectile mud column that hit me straight in the face. I had my eyes and mouth open, like an idiot, and couldn’t see for five minutes. I picked a piece of dirt out of my teeth last night, about 36 hours after the race. The Mud Mile culminated in an actual mile-long slog through slippery mud. We tried running it. It was a bad idea. Another obstacle was called Pyramid Scheme. The organizers built a plastic hill about 12 feet high and dug a 3-foot ditch at the bottom. They then filled the ditch with mud; predictably, you had to get over the hill. When we arrived at the obstacles, we eight med students, we watched for about fifteen minutes as people attempted the most absurd ways possible to reach the top: jumping from someone’s shoulders, attempting to army crawl up a 45-degree incline, creating a human chain, etc. When we got up to the front, we took charge and directed three giant meatsticks in the ditch to stand with their facing the pyramid. Two tall people stood atop their shoulders, and a third person clambered up over and reached the outstretched hands of people dangling over the top edge. Success. Grueling, muddy success. 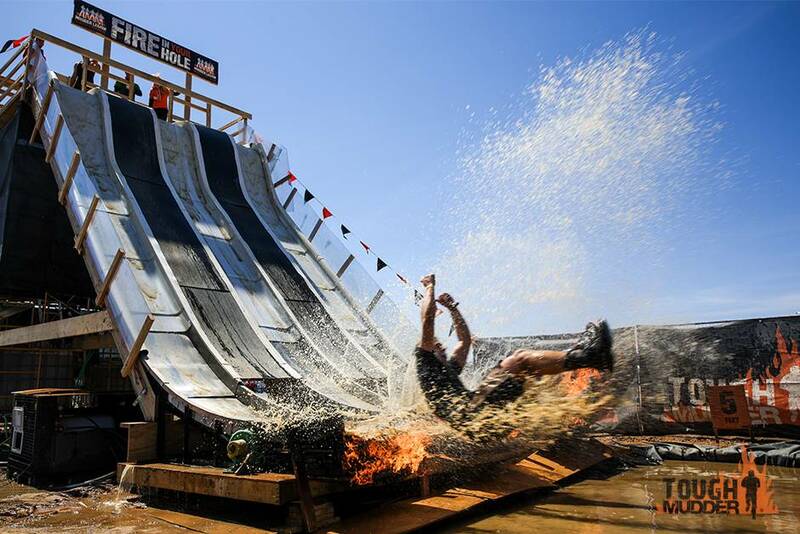 The final obstacle of the day was a fifty-foot water slide into a mud pit. The end of the slide was hooked up to a propane fire, because why not. All around, it was a fun day pretending I am much more intense than I actually am before I retreat into a study carrel for five weeks to teach myself neuroanatomy. No one picked up serious injuries and the Chipotle afterward was predictably phenomenal. Anyway. Med school. Really, I haven’t written because this block has simply not been funny. We’re in neurology, and as best I can tell neuro consists of the word “associated” – as in, “the amygdala is associated with fear” – which really means “we have no idea what the amygdala does, but it lights up on scans and stuff!” Learning neuro also means memorizing hundreds of anatomical structures without any knowledge of what they do. For instance: there is a thing called the uncus on the bottom of the brain. That’s it. The uncus is a thing. It’s there and it probably does stuff. Okay, I threw the neurobutthole in there just to see if you were paying attention. But the rest are all real-ish things that are incredibly difficult because, I don’t know, we’re still at the level of pretty pictures and theories with the brain. End soapbox. Second, you are always wrong. In our pathology group, the professor passed around a sheet of gunk resembling wet elementary school paper towels (for those of you in the know, this was dura) that normally lines the brain and helps protect it from high school football, plate-throwing girlfriends, and bar fights. The dura we were looking had big hunks of blood streaked all over it. Sounded good to me. At the time I knew of mad cow disease, projectile railway spikes, and Alzheimer’s Disease as Things That Mess Up The Brain, so meningitis sounded as likely as anything else. As Meningitis Guy was gathering support for his nascent theory, the specimen made it back to the professor. “So what is this?” she asked. “MENINGITIS!” screamed Meningitis Guy, waving his arms wildly as his eyes rolled back in his head. Okay, not really. He mumbled “meningitis” quietly, hoping she wouldn’t hear. “That’s wrong,” came the brisk reply. It turned out to be a subdural hemorrhage, which makes sense given the blood. Duh. So we are just generally always wrong. More importantly, the professors are probably always wrong, too: at the beginning of med school our orienters told us that statistically, about half of what we learned in medical school would be proven incorrect or obsolete by the time we finished residency. Given the amount of hand-waving that goes on with brain stuff, I’d put my money on neurology as responsible for all of it. But I’m probably still wrong. You guys are too adventures.But its bit dangerous.We must take care of our self.Mud mile is a great obstacle which i haven’t heard ever. You are hilarious. We would be friends if we went to same school. Keep up the funny writing. I don’t know how you find the time. I’m in my 4th year so I know your pain.